Over the years I've avoided (for the most part) wading into politics because it's not that sort of blog. Plus, I'm often ambivalent and usually wouldn't know what I was talking about anyway. Currently a big local controversy is a vote on a tax increase to fund transit expansion. I'm not ambivalent on this. Proponents of the proposition (the Yes Side) believe Translink (the transit agency) is well run. And even if they believe it's not well run they're willing to support it. The No Side, doesn't like the idea of a tax increase for one reason or another. I voted No, but not because I don't want to pay more for better transit. I want to see changes to Translink (the region's transit agency) before they get any more money. I only noticed these posters in the stations recently. When I voted I didn't spot any mention of Canada Line platform extensions on the ballot. This is a stunning development for me, the Canada Line is not even six years old. If a light rail line needs to lengthen station platforms after six years (or ten years) someone is incompetent. I'll be in San Francisco, where the subway platforms are half a mile long (or whatever), for a few days. Ranting is sometimes good for the soul!! 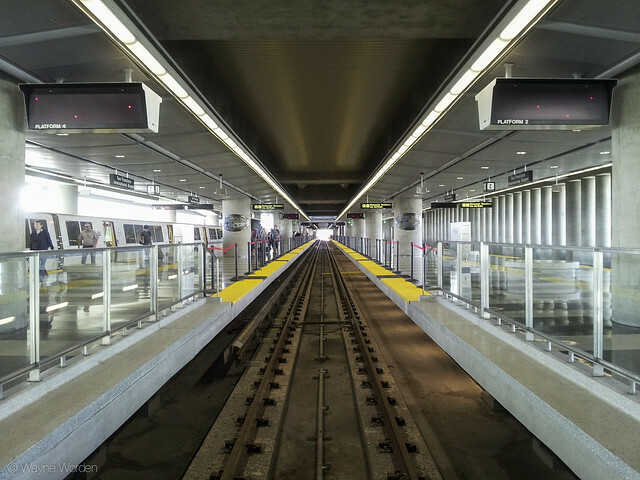 Love the perspective on the San Francisco platform—perfect, and so shiny!! OMG I can't believe you'd go there. It was obvious from Day 1, August 2009 when the Canada Line opened that the platforms were too narrow and not long enough. Just plain bad planning.